The vision of the University of Hawaiʻi at Hilo Security Department is to enhance and preserve the quality of the learning experience of each member of our university and by actively working together to provide a safe and secure environment. We recognize that effective campus security is achieved by establishing a professional and trusting relationship with those that we serve. The mission of the University of Hawaiʻi at Hilo Security Department is to foster feelings of safety and personal comfort in which to learn, live, work and grow. We will accomplish our mission by collaborating with the faculty, staff and students of the university and by partnering with other groups and organizations in the community to provide services in a professional and courteous manner. We will ensure that all who we serve are treated with dignity and respect. 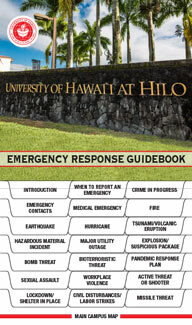 The University of Hawaiʻi at Hilo Security Department personnel are committed to a service philosophy of “Professional Security.” The concept of “Service First” will prevail in the way security responsibilities are administered and carried out. Recognizing that the Department’s mission is best attained through training and community outreach, employees are collectively committed to establishing collaborative partnerships with individuals, groups and departments for the purpose of: Identifying and resolving safety and security concerns, educating the campus community in the delivery of safety and security services and delivering security services in a professional and respectful manner. We aspire to the concepts of trust, integrity, respect, and accountability in the performance of our responsibilities. We will meet high standards. Work with positive attitudes, assume responsibility, and be accountable for our behaviors, decisions and actions. We will achieve success through cooperation, partnership, and teamwork. Only through internal and external cooperation can we accomplish our mission. We encourage involvement at all levels and provide information through clear and open communication and objectivity. We encourage feedback and active participation in problem solving and resolution. We will take full responsibility for our actions and be accountable for the services that we provide to ensure the safety and security of faculty, staff and students. We believe that proper training is integral to a well functioning professional organization. Learning and advancing competency are essential to our growth as individuals and as an organization. We will provide whatever is necessary to grow personally and professionally. We recognize that the “status quo” will not allow us to grow as an organization. We must confront and embrace change, and actively seek new and better ways to fulfill our mission. We believe in using our best judgment in our work and in making decisions based upon objective research and analysis. We believe in providing quality services in a timely and professional manner. We are service driven, partnership-oriented, and we strive for excellence. We endeavor to provide services in a fair, friendly and respectful manner, sincerely caring for the welfare of people. Enhance compliance with the Clery Act. Develop a safe/secure feeling on campus. Implement training program for security and staff. Set up 24/7 Security Office. Improve access control with newer technology. Conduct campus security climate surveys. Recognition of the contributions and value of each employee with employee of the month and year awards. Increase work standards and competencies through training, guidance, coaching and discipline. Increase employee technical skills and know ledge with on the job training and development. Improve employee recruitment and hiring. Develop management and supervisory skills. Develop employee incentive, recognition and awards programs.